TestPattern.org: Is McCain More Goldwater or Kucinich? 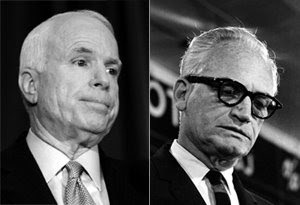 Is McCain More Goldwater or Kucinich? Did you catch Obama's recent one-liner about McCain's flip-flop on the current financial crisis? "John McCain can't decide whether he's Barry Goldwater or Dennis Kucinich," Obama said, referring to the libertarian free-market conservative Republican and the left-wing Democrat who opposes free trade. "He's not clear about what he thinks or what he believes." "Well, I have a message for Senator McCain," Obama continued. "You can't just run away from your long-held views or your life-long record. You can’t erase twenty-six years of support for the very policies and people who helped bring in this disaster with one week of rants. You can't just erase all that with one week worth of rants. What we need is honest talk and real solutions." Obama made mention of McCain’s pledge today to fire Securities and Exchange Commissioner Chris Cox, which a president does not have the legal ability to do in a literal sense, though certainly political pressures can be brought to bear to force a commissioner to resign. "He's calling for the firing of the Securities and Exchange Commission(er)," Obama said, "Well, I think that's all fine and good, but here's what I say: In the next 47 days, you can fire the whole Trickle-Down, On-Your-Own, Look-the-Other-Way crowd in Washington who has led us down this disastrous path. Don't just get rid of one guy, get rid of this administration, get rid of this philosophy, get rid of the do nothing approach and put somebody in there who is going to fight for you."